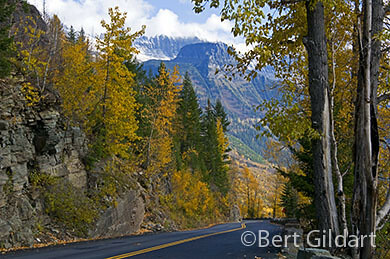 ©Bert Gildart: Except for the last hundred yards of driving, this past Sunday Glacier National Park’s Going to the Sun Road couldn’t have been more perfect, bringing satisfaction to lots of people who decided to take the last drive possible for this year. 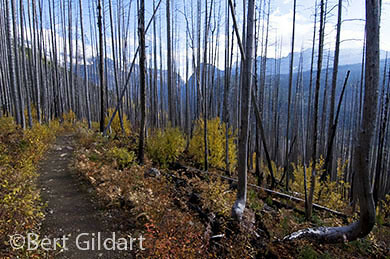 On Monday, at 8 a.m., Glacier closed “Sun Road” from Avalanche Campground to Logan Pass. Realizing closure was imminent, Janie and I joined others in the pilgrimage. Skies were blue almost the entire distance until just before we reached Logan Pass. There, about 100 yards from the summit, a dense cloud bank obscured vision. Though we continued to the pass, our plans to hike from the visitor center two miles to the Hidden Lake Overlook were abandoned. Instead, we retraced our drive and devoted our day to photography. Included here are a few photographs from our Sunday outing. Except for the afore mentioned section, views from along the entire drive were incredible. On the west side of Logan Pass, the day was clear and we could recall but few times when the colors from aspen and cottonwood were as vivid. Because hiking had been our objective we decided we’d hike the trail beginning from the West Side Loop. 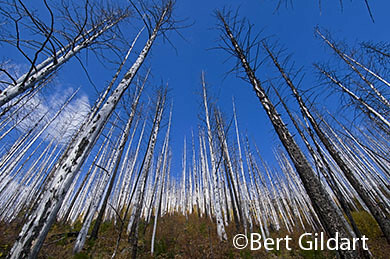 A logical destination would have been four miles up the trail to Granite Park Chalet (post1) (12 Miles with a Six-Year Old), but we became so engrossed with the stark statement of trees burned in the fire of several years ago that we spent most of our time photographing old snags. Sometimes I like patterns, ideal in this situation for my 12- to 24mm wide angle Nikon lens. In fact, all of the photographs shown here were made with that lens. Though the road is now closed to vehicular traffic, after the park road crew has prepared the famous road for winter, it will again reopen for bicycle traffic. In spring, bicycling the road has become a ritual for me, and if fall weather holds, I may try and pedal the 15 miles from Avalanche Creek (point from where it’s now blocked) to Logan Pass. With the closure of the highway, the park service must now give up hope of finding the remains of the young man from whom the park conducted a several month long search. On August 19th, Yi-Jien Hwa, 27, was reported missing by his family, and since that time the park sent teams of hikers and professional alpine searchers into the most forbidding areas of its backcountry to look for him. One of those areas was the terrain surrounding Logan Pass. Aside from that, it appears as though the park had a very good year, and Janie and I always regret the closure. Still, this year we spend a considerable amount of time camped in the park, living as we always do when we go for extended periods of time out of our Airstream. We have lots of good memories, and certainly, as you can see, the season ended on a glorious note. 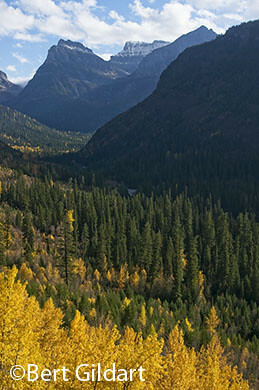 This entry was posted on Thursday, October 23rd, 2008 at 6:02 am and is filed under Glacier National Park, Montana Photography, Photography. You can follow any responses to this entry through the RSS 2.0 feed. You can leave a response, or trackback from your own site.